The PNP Bipolar Junction Transistors (BJTs) used in tutorials are discussed here. You should already be familiar with NPN transistors. The PNP transistor symbol used in circuit diagrams is shown on the right in the diagram below. The PNP transistor symbol has an arrow pointing in. Compare it with the NPN transistor on the left. PNP transistors have emitter (e), base (c) and collector (c) terminals just like NPN transistors. 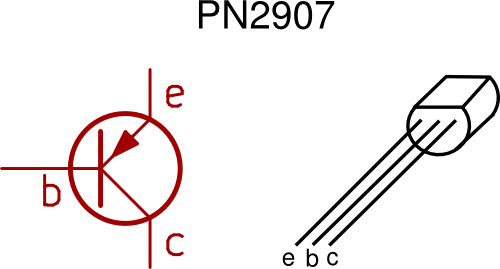 The diagram below shows the pinout for a PN2907 PNP transistor. You may have noticed that the PNP transistor symbol shown here appears to be upside down compared to the one at the top of the page. It doesn't make a difference and you will find that transistors can be oriented any way in a circuit diagram. The transistor symbol is oriented to suit the circuit diagram so that the diagram can be as neat as possible. This does not mean that you can connect the emitter, base or collector to any part of the circuit.